I’m Pam Brockmeier Armstrong. I began my career as a “business analyst and consultant”, but soon discovered that the roles I was most drawn to were those associated with teaching. So I switched careers and became a high school math teacher. I taught in public school. I taught in private school. Then my first son was born, and I became a stay-at-home parent. Most of the time I simply take advantage of what’s happening in the moment. Periodically I search out specific ideas and lessons. Usually I follow my kids’ lead. Sometimes I guide my children. At it’s best, it goes back and forth. My intention is to enhance the natural paths that they are exploring already. My purpose is to fuel their curiosity and creativity. Why blog? Because math causes a lot of stress to a lot of people. Along with literacy, it is usually considered THE most important subject at school. And yet many people are uncomfortable with it. The purpose of this blog is to share the simple ways that I intentionally incorporate math education into my kids’ everyday activities (or to point out the ways that I see it happening without my having to be intentional at all!) Maybe you’ll notice it in your own family, maybe you’ll try something new, and hopefully you’ll have some of your own moments to share. 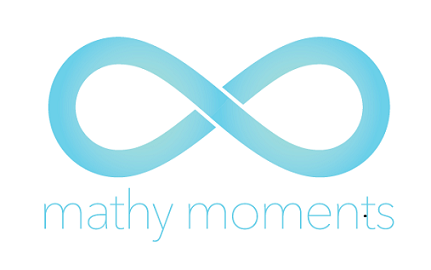 Thank you to Helium Design, Newburyport for the nifty infinity logo at the top of the page! Disclaimer: MathyMoments is a participant in the Amazon Services LLC Associates Program, an affiliate advertising program designed to provide a means for sites to earn advertising fees by linking to Amazon.com. Some posts may contain links to books, tools, toys, games, etc. that I found particularly useful. If you purchase a product through these links, your cost will be the same but MathyMoments will automatically receive a small commission. Your support is greatly appreciated!